Enter the KLG and Hoda A Mamma Mia London Adventure Contest Giveaway now for your chance to win a trip to London for the premiere of “Mamma Mia for you and your mom. To win the Kathie Lee and Hoda London Adventure Contest All you have to do is send us a video that’s up to 60-seconds explaining why your mom deserves the trip. HOW TO ENTER: Participants will be required to submit a video on the following theme: “Why does the mother or mother figure in your life (“Nominee”) deserves a getaway to London to attend the premiere of Mamma Mia! Here We Go Again!” (“Theme”). Video must have been taken by you and must not include any music. Prizes: There will be one (1) prize awarded consisting of the following trip: round-trip, economy class air transportation for Winner and one (1) guest from a major commercial airport near Winner’s residence to London, England; three (3) night hotel stay at hotel of Sponsors choice in London, England; two (2) tickets for Winner and Guest to the premiere of Mamma Mia! 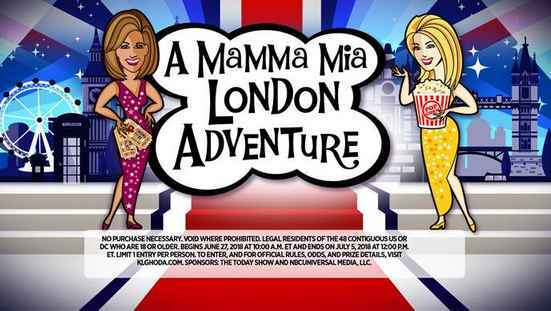 Here We Go Again on currently scheduled for July 16, 2018.
Who Can Enter: The A Mamma Mia London Adventure Giveaway is open only to legal residents of the of the forty-eight (48) continental United States or the District of Columbia (excluding Alaska, Hawaii, Puerto Rico, Guam, the Virgin Islands and other United States territories), and who are eighteen (18) years of age or older at the time they enter the sweepstakes. When To Enter: The KLG A Mamma Mia London Adventure Contest will begin on June 27, 2018 at 10:00 A.M. ET and end on July 5, 2018 at 12:00 P.M. ET. Sponsor: The contest is sponsored by TODAY Show, 30 Rockefeller Plaza, New York, NY 10112.